Appearance-wise, the changes are minimal but dramatic. Gone are the elongated, red plastic-covered taillights. They have been replaced by four round units that are recessed in a new “duck tail” design. The lenses are identical to those that appeared in the full-sized Chevrolet back in 1958, but have a completely different look here. The exhaust has been rerouted from the bumpers to a more conventional, under-the-car exit location. Up front you will find a stylish mesh grille treatment. 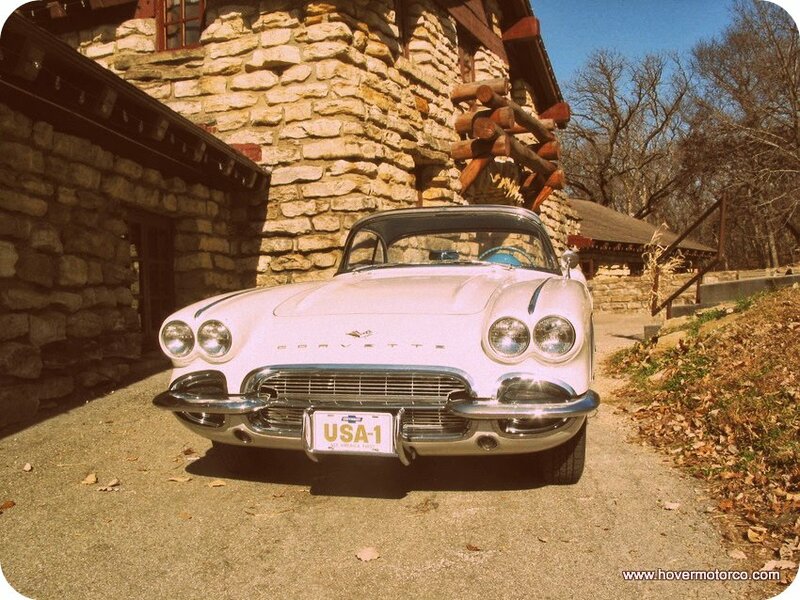 The chrome “teeth” that have defined this car’s looks from its inception are gone. You will also notice that the headlight bezels are now painted body color. We thought that it was an attempt to save some money, but Chevrolet claims it gives the Corvette a cleaner, more European flair. A large bracket with chrome bumperettes continues to house the license plate. You still get 15” steel wheels with either whitewall or blackwall tires. The whitewalls are still quite wide, which is losing fashion with Detroit’s latest dream cars. Hopefully, this throwback from the Al Capone era will dissipate in the next year or so. Most Corvettes will be equipped with these ornate wheelcovers with simulated knock-off-style spinners. Small hubcaps, which are carryovers from the 1959 Chevrolet Biscayne, are also available, although they will be reserved for the frugal-minded or competitive driving camps. 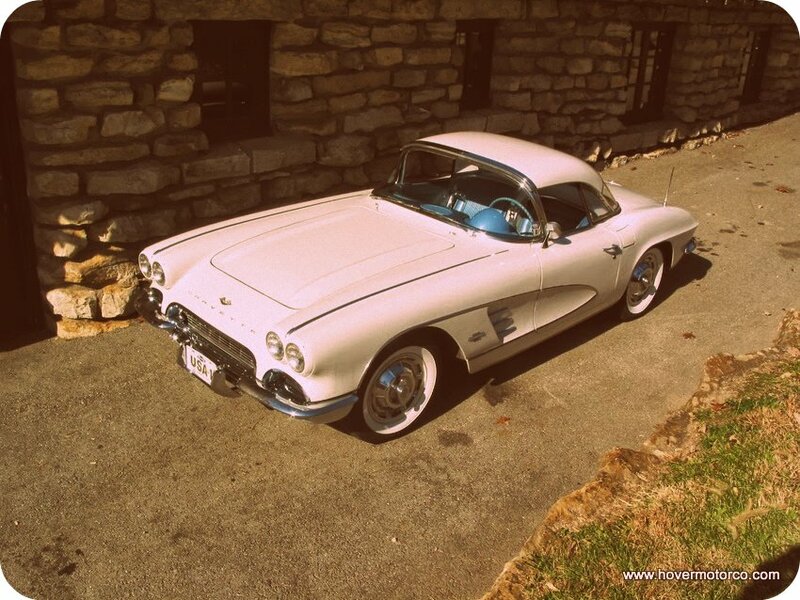 The Corvette’s body continues to be made from fiberglass, which has proven to be lighter and stronger than steel. This car also has a removable fiberglass top, which can be unbolted and removed by two people. For body panels that are molded instead of stamped, the fit and finish is actually decent. 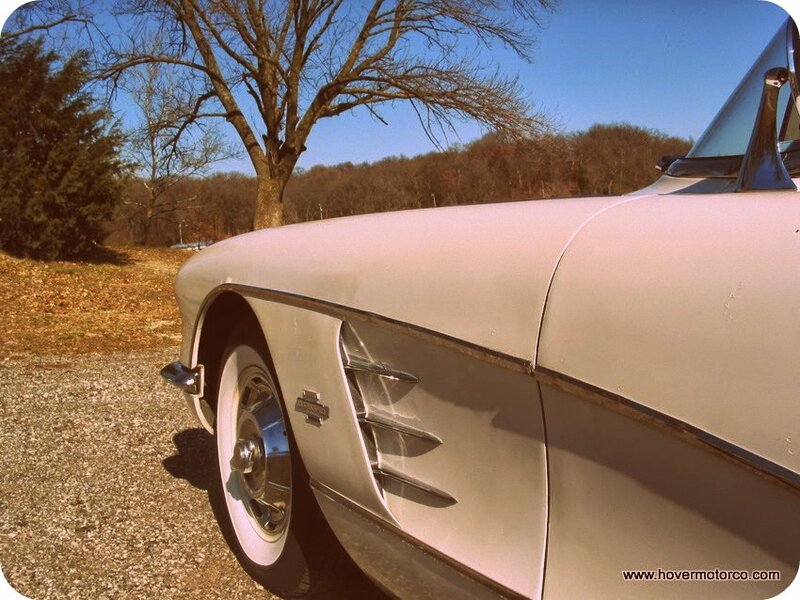 It is not as smooth as a steel-paneled vehicle, and earlier Corvettes have had issues with paint adhesion, but considering how revolutionary this technology is, it gets the job done. The new Corvette interior carries over fundamentally unchanged from last year, although there are a few improvements. For example, the width of the car is no greater, but somehow, the new seats make it seem that way. There is also a new, ribbed door panel trim that accentuates the interior lines. 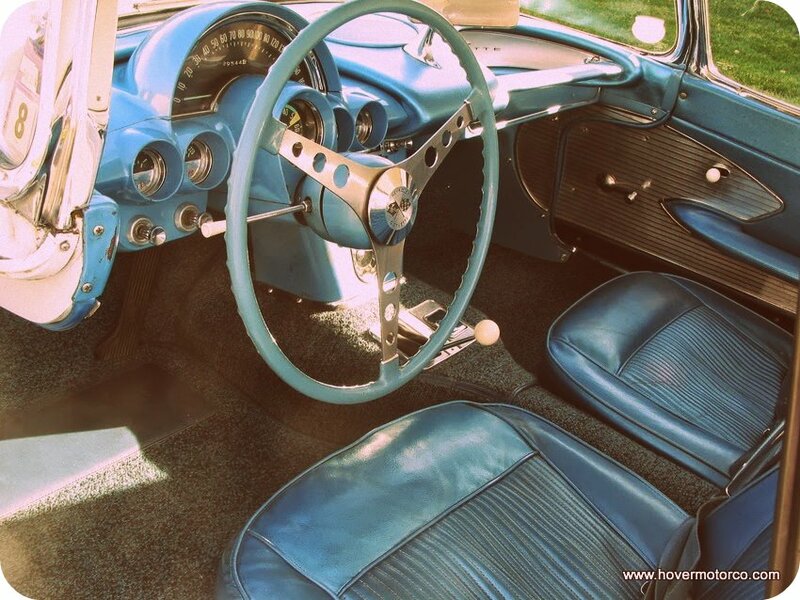 Overall, the method stylists used to make the body design cascade into the storage area between the seats, punctuated by the symmetrical layout of the dashboard, is quite artistic. The interior layout is comfortable, and everything is either visible or in reach. 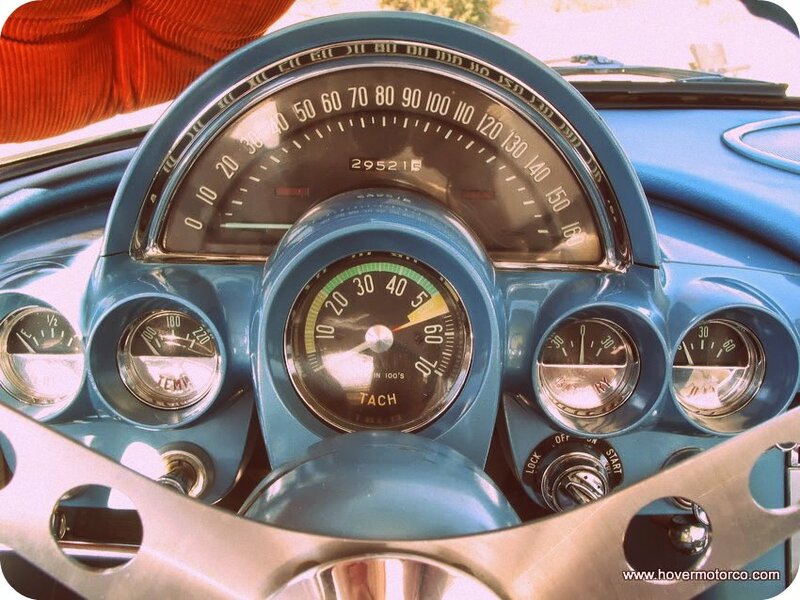 The speedometer surrounds the tachometer in a brilliant, half-circle layout. We set the fascinating, signal-seeking Wonder Bar radio to a station that was playing Bobby Lewis’ hit song Tossin’ and Turnin’, and that’s exactly what we wanted to do with this car when the road got curvy. This was a very agreeable place to spend time, even when taking it on a long tour. Our Ermine White and Jewel Blue test car was equipped with the base 283-c.i. 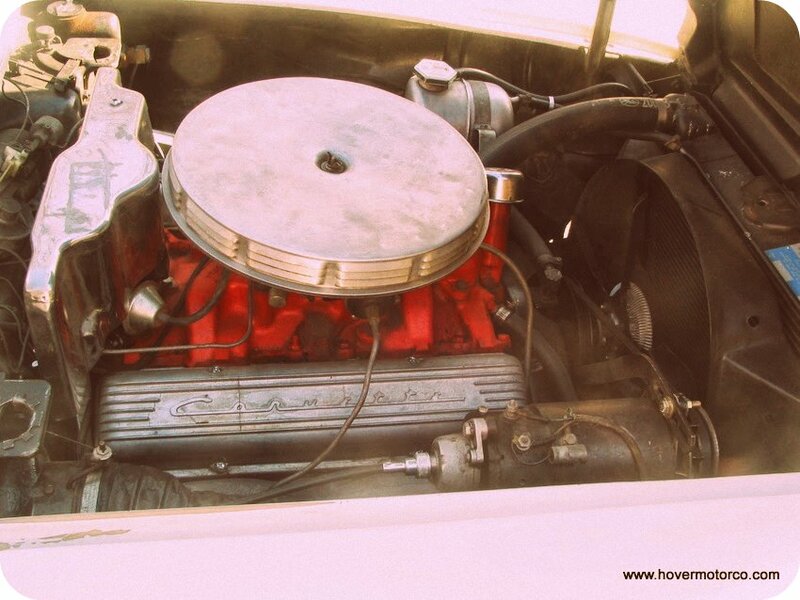 engine, which hosts a single four-barrel carburetor and is good for 230 horsepower. 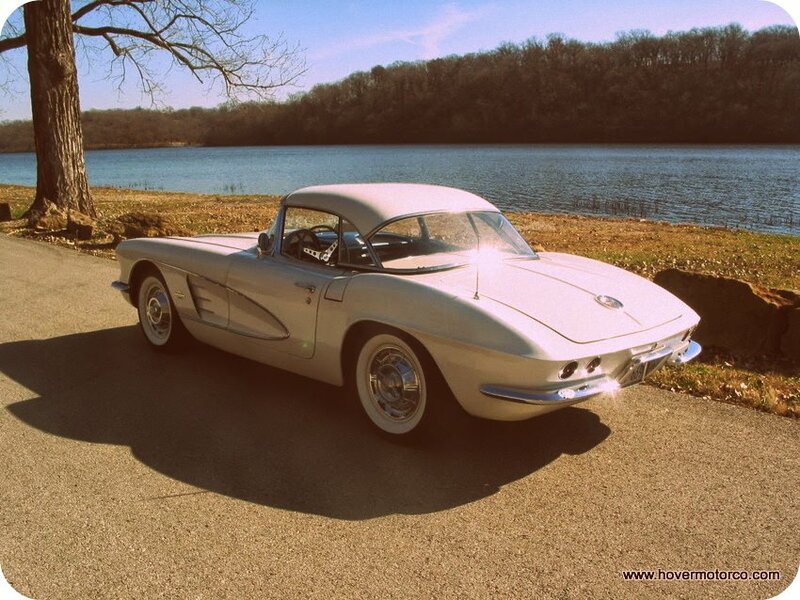 It also featured a Powerglide two-speed automatic transmission for refined driving. Of course, there will be more powerful options available, but even this setup exceeded the speed and acceleration of most cars we have driven. This is a state-of-the-art driver’s machine. The large displacement V8, combined with a curb weight of only 3,100-lbs, ensures that the Corvette will never have trouble keeping up with traffic. 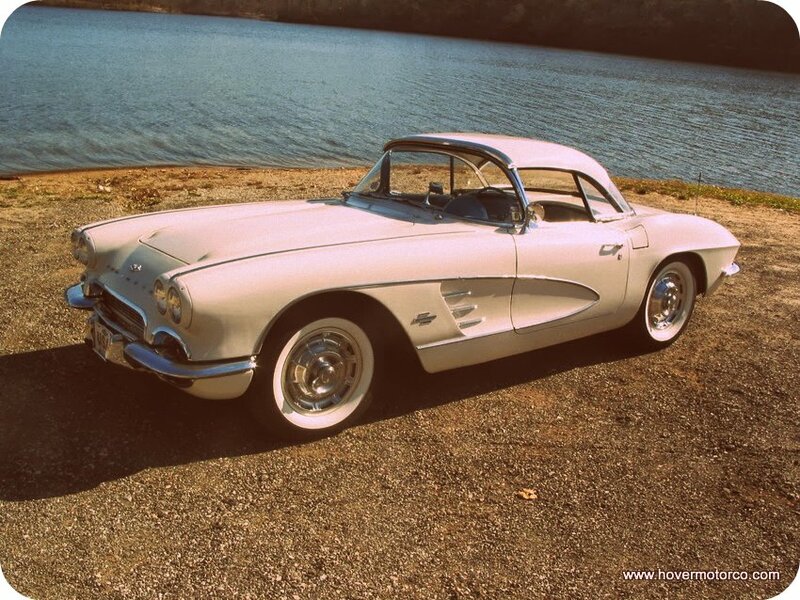 Behind the large, three-spoke wheel, you really get a sense of what the Corvette is all about. Chevrolet has continued to make the Corvette drive better each year, and despite the somewhat old-fashioned straight axle technology, it handles as flat and precisely as many European sports cars. 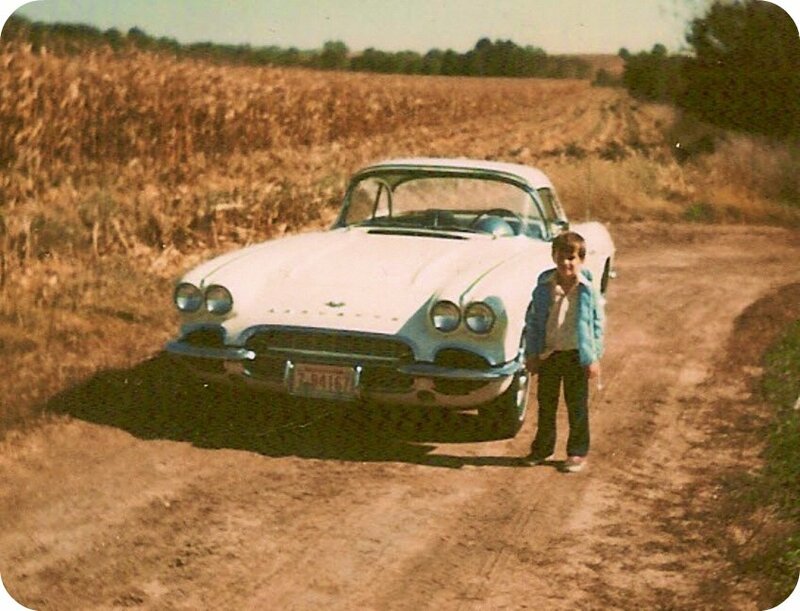 Today’s Corvette is more than just a drag strip hero. It will hold its own no matter what type of competition you throw at it. First time visitor here. Nicely done. Can I assume that is you in the final photo? Yep. That was me ... 35 years ago! Very cool! Remove the 'USA1' plate, wash the photos just a bit more in photoshop, and it would pass as 'O.E' !